This is the final report of the AIDS, Security and Conflict Initiative(ASCI) that was convened by the Social Science Research Council (New York) and Clingendael Institute (The Hague) between 2005 and 2009, with support from UNAIDS. ASCI is a global research initiative aimed at informing policy and programming by strengthening the evidence base and addressing critical gaps in knowledge in the fields of HIV and AIDS and security. HIV and AIDS pose diverse threats to human security and to international and national security. Security institutions and situations of insecurity and crisis influence patterns of HIV risk. Post-conflict transitions reshape and, in some cases, exacerbate HIV risks and impacts. HIV prevention and AIDS care and treatment are poorly integrated with security sector reforms, humanitarian assistance, peacekeeping and post-conflict peacebuilding. 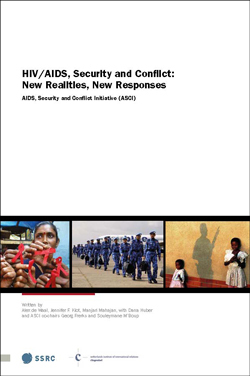 de Waal, Alex, Klot, Jennifer and Mahajan, Manjari, HIV/AIDS, Security and Conflict: New Realities, New Responses (Social Science Research Council, September 2009).